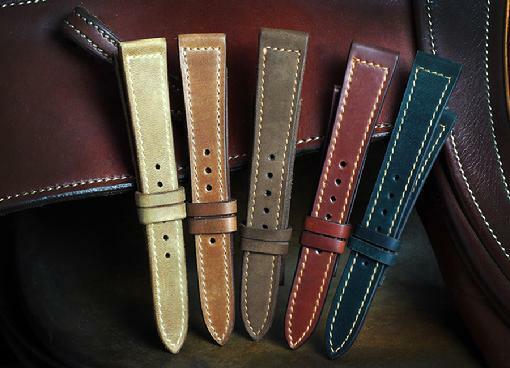 The materials used to making leather watch bands include alligator skin, crocodile skin, lizard skin, ostrich skin, stingray skin, calf skin, cowhide skin, lamb skin and so on. The finished leather contains preservative agent, drying agent and others to make sure stable material quality. Incorrect use causes the loss of the agent and accelerates the hardening, deformation or fracture of the leather. If sweat and dust are attached to your leather watch strap for long time, the leather watch band will give off abnormal odors. Even worse, due to different eating habits and living habits, your skin will be allergic to your leather watch band, if acid-base sweat and dust aren’t cleaned. How to clean and maintain your leather watch strap? Three tips will help you. 1. If your leather watch strap get wet, it should be removed from your wrist and dried with a piece of soft cloth, so that you can continue to wear it. If you won’t plan to wear it for days or more, let it naturally air dry. 2. If you find your leather strap gives off abnormal odors, use a soft-bristle toothbrush with some soap powers to wash it, then rinse it with water and squeeze foam out of the leather watch strap in the “Pinch-Loose” way. The whole process had better be finished in 15 seconds. Finally, let it naturally air dry. Remember, the watchband must be removed from the lugs first, then clean two parts separately. 3. In addition, consumers can apply Leather Watchband in oil, oil has a protective effect on the leather watchband, can make the maintenance more complete. 1. The most fascinating aspect of the leather watchband is comfort and elegance, but maintenance is another trouble. I suggest consumers wear their leather watchbands in the winter or in the air-conditioned occasions. Leather watch band avoids being worn in the summer and during exercises. If you need wear it, remember to clean it in time. 2. No matter how top end your watchband, it will produce abnormal odors some day, so to clean and dry it is the best way to maintain. You need notice that leather watchband may deform or deteriorate in the sun for a long time. 3. Don’t always wear the only watch band, it’s better for consumers to have a replaceable watchband or more. It can not only show your different styles but also extend the service life of your watchbands. How to choose a right replaceable leather watchband or more for your watch? To choose a right replaceable watchband follows the principle of beauty. To choose the color of a watchband is up to the color of the dial. There are dials in black, white, gray, gold, blue and so on. The dial in black and gray goes with a black leather watch strap, decent and elite. Black or gray dial matches with dark brown watchband, mature and elegant. The white dial has a wide range of choosing leather watchband in different colors. White and black look elite style. White and brown stand out elegant charm. White and dark blue appear energetic. The dial in gold goes with either golden brown or white leather watchband, standing out unique personal characters. It’s good to match the blue dial with the same color scheme. That’s my personal opinions, and you can achieve better effects according to your aesthetics.